Mary Joan ‘Mollie’ Swift lived at 2 Linthorpe Street, Newtown. She had been born in Junee, the daughter of Larry Maloney, a saddler and local alderman. She was married to William Henry Swift in 1912. She died on 19 July 1966. Mollie Swift was a justice of the peace (JP). When she was elected to Newtown Council in 1938, Swift made history as she joined Lilian Fowler as a female alderman on the council. She also served as Treasurer of the Royal Prince Alfred Hospital Ex-Patients’ Association in 1938. In 1962 was appointed to the Camperdown Memorial Rest Park Trust. 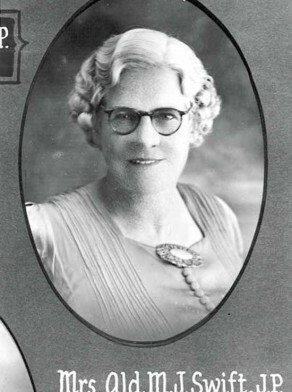 Mollie Swift was an alderman on Newtown Council in 1937-41, representing O’Connell Ward. She had replaced Alderman Frederick Roberts in April 1938. She did not stand again in 1941 due to ill health.